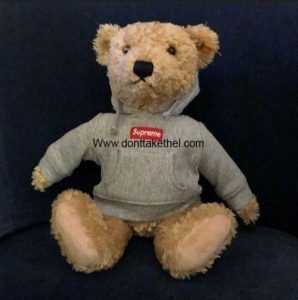 Since Supreme dropped their Fall/Winter 2018 preview, everyone has been gassed on the Supreme Steiff bear, and it’s finally about to drop this Thursday December 20th, retailing at $178. 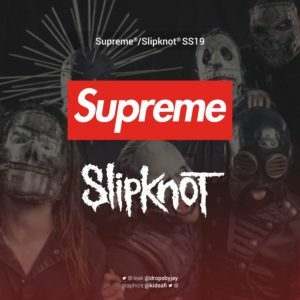 There have been rumors going around that this crazy accessory may not be quite as limited as you would think. 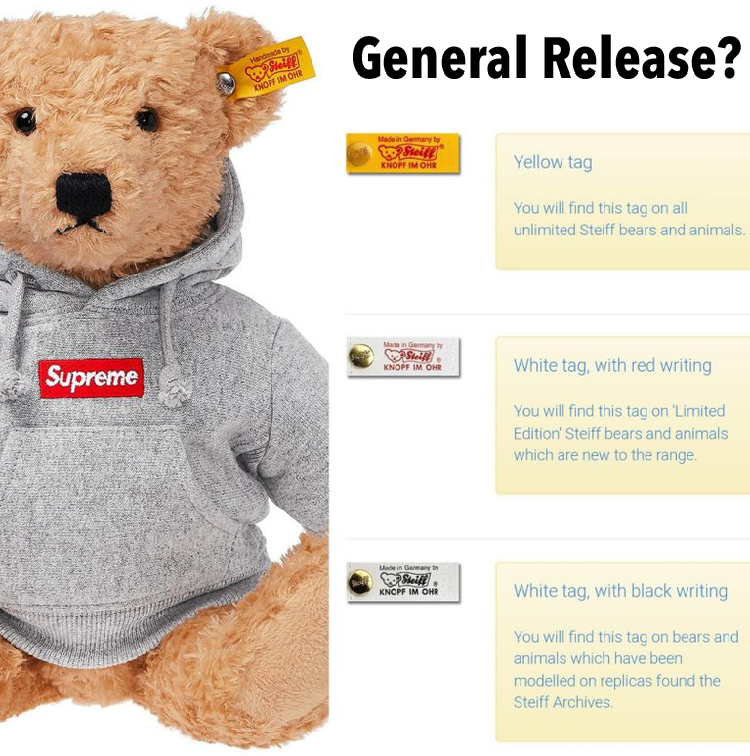 In the Supreme preview you can see that the bear has got a yellow tag attached to it’s left ear. 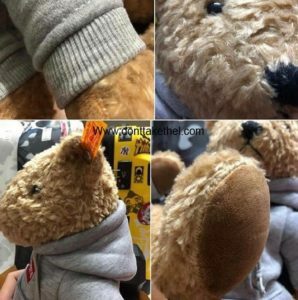 Whenever Steiff releases their bears, they utilize different colored tags/writing on the tags, which represents how limited each bear will be. Yellow tag: You will find this tag on all unlimited Steiff bears and animals. White tag, with red writing: You will find this tag on ‘Limited Edition’ Steiff bears and animals which are new to the range. White tag, with black writing: You will find this tag on bears and animals which have been modeled on replicas found in the Steiff archives. If you’re interested, you can find more information on the tags, on the Steiff website here. 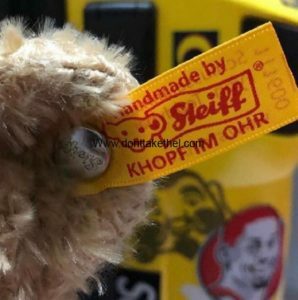 As you can see the yellow tag, which is on the Supreme Steiff bear, represents that the bear will not be a limited bear. 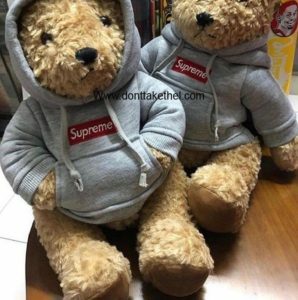 Supreme may have just used that bear for the preview, as it wouldn’t be the first time Supreme has sent out products different than their images. 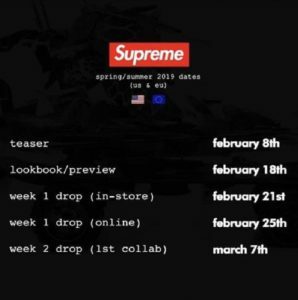 Or maybe they did use the general release bear but the small box logo hoodies will be what makes the bear limited. 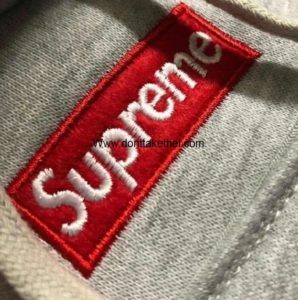 But it’s definitely interesting to see them release the preview pictures featuring the non limited yellow tag, and it will be interesting to see if this release really will be a relatively general release or super limited as initially expected. 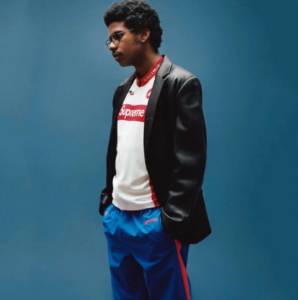 Check out some early pictures below!